Bridging Health Care and Social Services, Through Her Eyes Conference, GFMM in the news, and more. Join us for our event on Tuesday, 10/16. ﻿How Do We Get It Right? 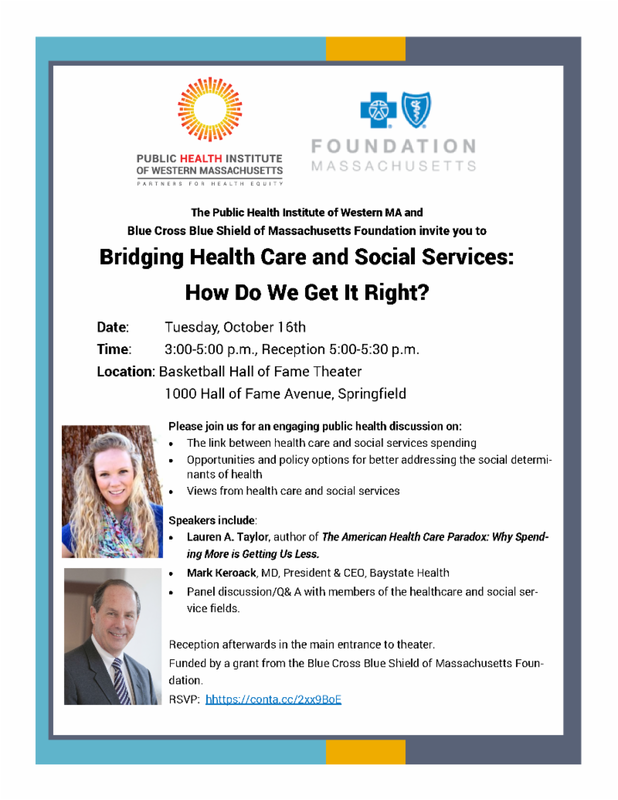 We're only one week away from our event, Bridging Health Care and Social Services: How Do We Get it Right? Please join us as we hold a conversation on the link between health care and social services spending, opportunities and policy options for better addressing the social determinants of health, and views from health care and social services. Time: 3 p.m. to 5:30 p.m. Funded by a grant from the Blue Cross Blue Shield of Massachusetts Foundation. The Go Fresh Mobile Market is in its 8th season and going strong! Check below for recent articles about the program and how it's making an impact in our local community. City of Springfield Health and Human Services, STCC Foundation, Trinity Health of New England/Mercy Medical Center, PeoplesBank, Health New England, Davis Foundation, Baystate Health, Boston Medical Center HealthNet Plan, Beacon Communities and Springfield Housing Authority. YMCA of Greater Springfield, City of Springfield Department of Elder Affairs, Public Health Institute of Western MA, Gardening the Community, Next Barn Over, Mountain View Farm, and the Caring Health Center. Join our Senior Research Associate, Jessie Gleckel, as she presents on Understanding Youth Health Inequities through Youth-Involved Data Story-Telling. During this workshop, Jessie will engage attendees in a process to look at youth population level data from Springfield to explore some of the mental and physical health inequities experienced among youth. Attendees will have the opportunity to work together to begin interpreting the data and telling a story that can help them advocate for responsive programs and/or policies. 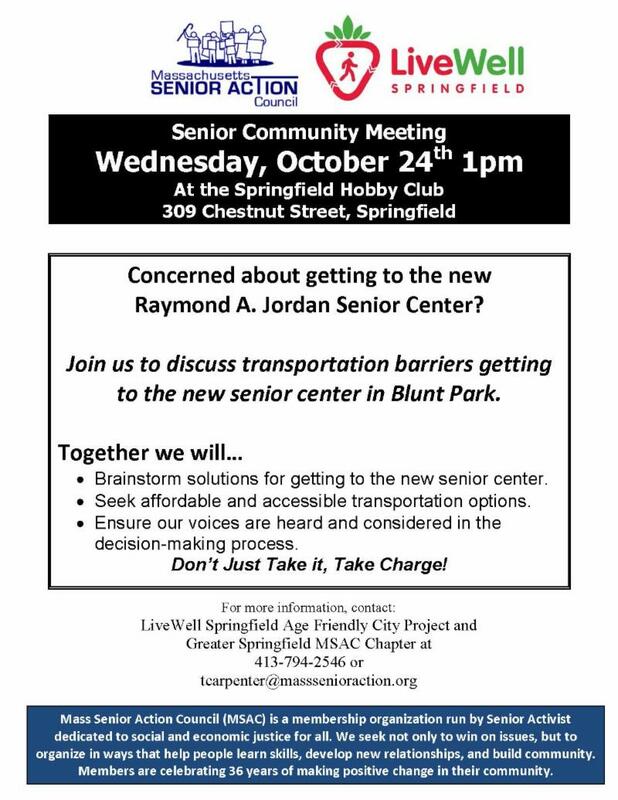 LiveWell Springfield Age Friendly City Project and Greater Springfield MSAC Chapter is hosting a discussion around with seniors around the transportation barriers getting to the new senior center in Blunt Park. For more information please contact them at 413-794-2546 or email tcarpenter@masssenioraction.org.